Music by JERRY GOLDSMITH Director of Photography ANDREW LASZLO A.S.C. (c) 1986 MGM Entertainment Co.
Director of Photography ... ANDREW LASZLO, A. S. C.
Casting by ... JOSEPH D'AGOSTA, C. S. A. Assistant Art Director ... WILLIAM J. DURRELL, JR. Camera Operator ... ROBERT MARTA, S. O. C.
Make-Up Artist ... BEN NYE, JR.
Best Boy Electric ... RICHARD HARTLEY, JR.
MICHAEL J. KOHUT, C. A. S.
CARLOS DeLARIOS, C. A. S.
AARON ROCHIN, C. A. S.
© 1986 MGM Entertainment Co.
All rights in this Motion Picture reserved under International Conventions. 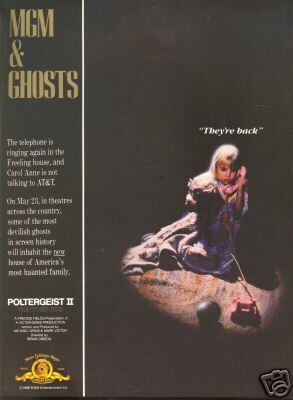 "Poltergeist II: The Other Side"